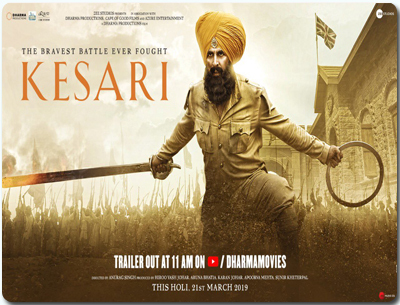 Kesari is a 2019 Indian Hindi-Language action-war film directed by Anuraj Singh and it got released on 21 march 2019.Its stars are Akshay Kumar, Parineeti Choopra, Rakesh Chaturvedi, Vivek Saini, Vikram Kochhar. The film is produced by Dharma Productions, Cape of Good Films, Azure Entertainment and Zee studios. Kesari is a powerful film because it has an innate sense of emotional intelligence and raw shock value. It showcases the atrocity of war and violence unabashedly, always condemning the bloodshed at hand and forever celebrating the bravery of men. It’s an action film and also war drama film. A retelling of the Battle of Saragarhi where 21 Sikh soilders fought against an Afghan army of 10000 men in the year 1897. Anuraj Singh’s Kesari is a action-war film, Akshay Kumar plays the leading role. The film also includes Parineeti Choopra, Vivek Saini. The Battle of Saragarhi is considered to be one of the most inspiring stories of human valour and bravery, not just in India, but the world over. The Battle of Saragarhi was fought on September 12, 1897, during the Tirah Campaign, that was fought between Sikh soldiers of the British Indian Army and Pashtun Orakzai tribesmen of Afghanistan. It occurred in Khyber Pakhtunkhwa, Pakistan which was then a part of India. It is one of the greatest last stands in military history. 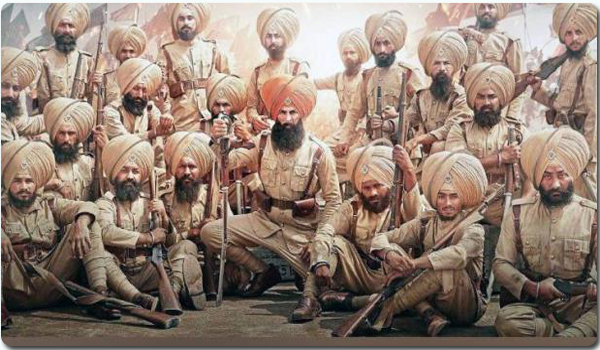 This film is a fitting tribute to the story of Sikh soldiers. 21 Sikh soldiers held the fort against more than 10,000 rampaging tribesman for over six hours. Sepoy Gurmukh Singh was the only survivor during the battle. He was the one who sent signals to Colonel Haughton, situated in Fort Lockhart, that they are under attack as 10,000 Afghans reached the signalling post at Saragarhi. In response, the Sepoy received a disheartening message that immediate help cannot be sent. Without any help the soldiers decided to fight till their last breath to prevent the enemy from reaching the forts. The Pashtuns broke a portion of the wall of the picket, with the leaders allegedly and making promises to the soldiers to entice them to surrender. After long attempts the wall was breached killing all the Sikh soldiers except Sepoy Gurmukh Singh. Sepoy Gurmukh Singh started to killed 20 Afghans.When he was dying, he said to have yelled repeatedly the Sikh battle cry “Bole So Nihal, Sat Sri Akal!” .The total casualties in the entire campaign, including the Battle of Saragarhi, numbered around 4,800. The movie is produced by Dharma Productions, Cape of Good Films, Azure Entertainment and Zee Studios. The music of the film is composed by Tarishk Bahchi, Arko Pravo Mukherjee, Chirantan Bhatt, Jasbir Jassi, Gurmoh, Jasleen Royal.